Belton Richard, born in 1939 in Rayne, has been a very popular Cajun musician for decades. During the 1960s and the 1970s, his dancehall band, the Musical Aces, attracted crowds wherever they went up. After retiring from performing regularly, he has begun in 2002 to appear at a number of festivals and other venues. Even while he was not active on stage, his songs continued to be part of the standard repertoire of most Cajun bands. He is a remarkable singer and song writer, with a number of regional hits to his credit, including "Le Paradis des musiciens" and "Un autre soir ennuyant" (inspired by Jimmy Clanton’s "Another Sleepless Night"). In addition, his French versions of songs like "Behind Closed Doors" and "The Streak" (with Floyd Soileau playing the role of announcer and uttering the memorable description "nu comme un ver") were popular among Cajun audiences. At age seven, Richard learned to play accordion from his father. By age 12, he was playing professionallly with "Neg" Halloway and the Rayne Playbpoys. Richard shifted to performing rock and roll as a teenager but returned to his French roots in 1959 when he formed the Musical Aces. His experience with Louisiana’s version of rock and roll, known as swamp pop, carried over into his Cajun music. He was determined to bring new life to Cajun music by adding songs that told stories sung in a smooth, contemporary style instead of the older Cajun style that originated when vocalists had to project their voices across the dancehall without any amplification. Ann Savoy has described his baritone vocal style as comparable to the style of "country singer George Jones in his prime." 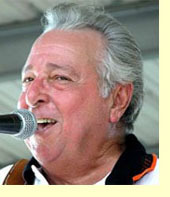 Richard’s singing style has been widely imitated by other Cajun vocalists. Richard is also an excellent accordion player. According to Savoy, the Musical Aces were the first to use an electric bass, and Savoy also credits Richard with popularizing the sound of two fiddles played in close harmony. Belton has recorded five albums, seventy-two singles and three CD’s. He quit playing music when he was 47 years old due to stress and burnout. Richard retired from performing in 1987, but, after being receiving various honors, including having the 1995 Festivals Acadiens dedicated to him, he recorded a new CD, I’m Back, for Swallow Records of Ville Platte, the label on which all of his albums were released. Also available on CD is The Belton Richard Collection, released in 1999. As of fall 2000, Swallow lists Richard’s other recordings as being available only on cassette: Modern Sounds of Cajun Music, Belton Richard - Volume 2, Good ‘n’ Cajun, Louisiana Cajun Music, At His Best. Richard was chosen to be one of the original members of the Cajun French Music Association’s Hall of Fame, established in 1997.